On his first state visit to India, Afghan President Ashraf Ghani pushed for closer trade and defense ties. As Afghan President Ashraf Ghani is in India for a two-day visit this week, centered on strengthening trade ties and partnering to fight terrorism, he again waded into the fray of South Asia’s fractious politics. With Afghanistan still courting China and Pakistan, boosting its relationship with Delhi could prove complicated. 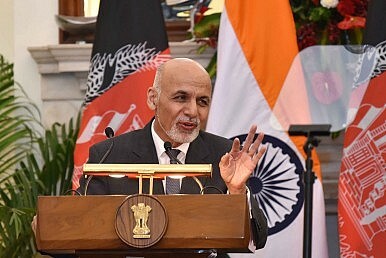 India and Afghanistan have enjoyed close ties since the U.S.-led International Security Assistance Force (ISAF) kicked out the Taliban government in 2001. Ghani’s predecessor, Hamid Karzai, proved a close friend of the Indians, and they treated him in kind: Afghanistan received $2.2 billion in Indian military and monetary aid over the course of his 13 years in office. But Karzai is gone now, and the United States, despite its decision to keep troops in Afghanistan through the end of the year, has one foot out the door. Ghani faces a trying prospect: playing the middle ground between China, India, and Pakistan. That has meant turning down a heavy arms order from Delhi left on the books from Karzai’s time in office, sending six elite troops to train in at the Pakistani Military Academy in Abbottabad, and accepting China taking a leading role in peace talks with the Taliban. But if Ghani is going to bring in big foreign investors, he’ll have to do more than talk up Afghanistan’s fractious security climate; his young administration will have to deliver results. On Monday, Ghani delayed his visit to India by several hours after heavy fighting broke out in the Northern province of Kunduz, leaving 30 Taliban fighters dead after they attacked police and army checkpoints. As The New York Times reported earlier this week, American drones and special operations forces continue to take the fight to the Taliban and other insurgents, even though combat operations were supposed to wrap up last year. That’s not lost on India. “We share Afghanistan’s pain over persisting terrorism and extremist violence that destroy lives and derail progress,” Modi said in a statement prepared by his office on Tuesday. India is hardly shy about the strategic and military aspects of the relationship. One of the top investors in the war-torn country, Delhi hopes to join the Afghanistan-Pakistan Trade and Transit Pact (APTT), and Prime Minister Narendra Modi expressed optimism that the Trans-Afghanistan pipeline (TAPI), a $10 billion project that will transport natural gas all the way from Iolotan, Turkmenistan, just east of the Caspian Sea, to India and Pakistan, would be completed in the next five years. Modi also pledged to push ahead with plans for a deep-water port in the Iranian city of Chabahar, giving Afghanistan another potential route to the sea. On the military side of things, India recently delivered three Cheetal helicopters to Afghanistan. The visit was a good first step in establishing an important relationship. But with the fight against the Taliban ramping up, and both sides eager to avoid upsetting China and Pakistan, the region will change quickly over the next few months. Delhi and Kabul should be prepared for a bumpy ride. India and Afghanistan continue to draw closer together.